That doesn’t mean you can’t swim on your hike, as long as you take some simple precautions. 1. If at all possible, don’t swim alone. Most of the lakes are small, and if you were to get in trouble, even the most unskilled bystander might be able to drag you ashore. 2. Consider taking your dips during your lunch break (oh, and by the way, there is no need to wait an hour after eating for that swim in the lake). Lunch is better than late evening simply because you won’t be as fatigued. You’ll also dry out much faster when you emerge. 3. If you must swim alone, don’t get in over your head (figuratively and literally). I grew up on a lake in Michigan and spent whole summers continually in the water. I’ve spent years surfing in Hawaii. My rule is this: if I am by myself, I don’t go deeper than hip high. That gives me plenty of room to swim and to submerge myself in order to run water through my hair. It also allows me to easily stand up. 4. Remember, in creeks, streams, and rivers, it’s often the current that will get you, not the depth of the water. More than one person has died when their foot has become jammed into rocks or a log at the bottom, while the current holds their head underwater. 1. Either of the Cathedral Lakes. Just be sure, before jumping off the granite, you know how you’ll be getting out. Steep, slimy rock can be hard to climb. 2. Any of the granite slabs in the Tuolumne while hiking through Lyell Canyon, as long as the current isn’t too bad. The slabs are a great place to sun yourself, after, as well. 3. Thousand Island Lake. Pick an island and go claim it for an hour or two. 4. Marie Lake. This is another place to go island exploring. This is also my choice for the prettiest lake on the entire trail. 5. Warm Lake, near Muir Trail Ranch. Hat tip to John Ladd for the suggestion and the link. By the way, the lake really is warm. 6. Dollar Lake or one of the Rae Lakes. Many folks have tried to convince me that the Rae Lakes are the warmest (non-hot springs) lakes in the Sierra Nevada. Try it out and tell me what you think. I’m still skeptical. 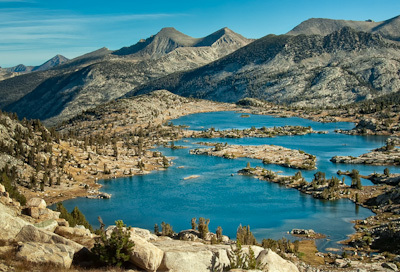 Last: all these lakes are in the wilderness, but not THAT far into the wilderness. Chances are you are going to see other people while you backstroke. You aren’t going to offend me if you’re naked, but you might offend others. Silver Pass Lake, north end. Wide sandy beach with a gentle slope into the lake. Great views and privacy. Upper Rae Lake, end near the ascent to Glen Pass. Again, nice slope into the water. Yes, temperatures are moderate. No diving! Lots of underwater terrain features. Anywhere on the Le Conte Canyon ….. some great hidden swimming holes in the meadows with little or no current. Thanks, Ken. Sounds like great spots. Ray, I used to swim everyday on my Sierra backpack trips. Now in my senior years, I swim much less often. A few years ago, I took my granddaughters backpacking to Z Lake, near Saddlebag Lake. They swam in all the cold lakes and finally persuaded my wife and me to join them. We nearly drowned! As soon as we reached deep water, we started hyperventilating, and had no energy left to swim. I thought it was the altitude, but learned it is called “Cold Water Shock”. It kills many people each year, but is not at all well known. Kayakers know about it, and a few sports physiologists. Your advice to stay is shallow water is good. You can also prevent it by immersing yourself regularly in cold water. Even once per year can protect you for the rest of the year. My favorite swimming holes are shallow ground water ponds with no inlet or outlet. They can reach 70 degrees on a warm day. Sounds scary, Mike. I had never heard of it, despite spending most of my life around large bodies of water. Thanks!